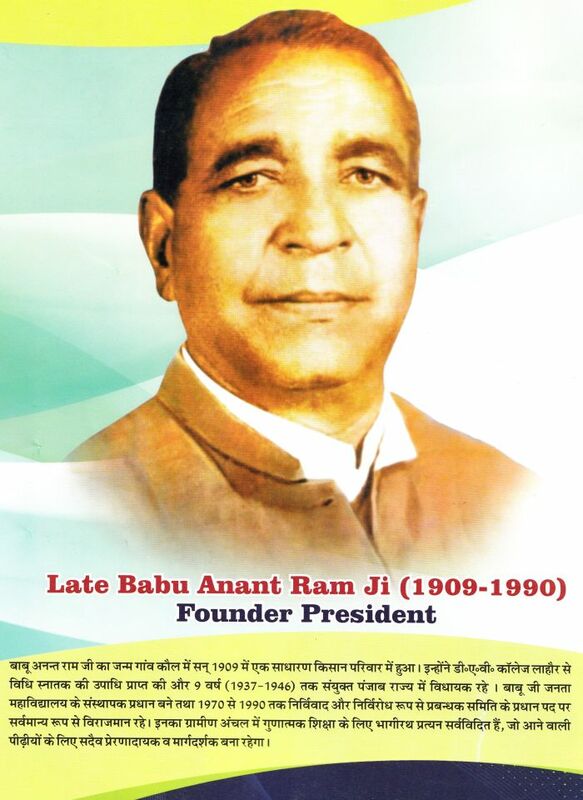 Babu Anant Ram Janta College, Kaul which was established in 1970 and was the first college affiliated to Kurukshetra University, Kurukshetra following the path of its visionary founder, late Babu Anant Ram Ji, Ex-MLA in erstwhile State of Punjab and architect of this institution, late Ch. Ishwar Singh Ji, Ex-Speaker, Haryana Vidhan Sabha to disseminate quality education in educationally starved rural area. The college is situated in agrarian, rural and literary backward region of the village Kaul, the village of Arjun Awardee, International Volleyball player Late Sh. Balwant Singh, so craze for sports and games dominates the surrounding area. 1. To provide quality education to the student with minimum financial burden on parents. 2. To bring about all-round development of child . Emphasis is on moral, physical and educational growth. 3. To equip the student in battle in life winding their sphere knowledge. Building their character and grooming their personalities. 4. To inculcate positive value of life such as sincerity. Honesty, truth, justice, dedication, devotion and service to fellow beings. 5. Properly channelies youthful energies towards creativity and self actualization. 6. Broaden the outlook of the student through training in co-operation, team spirit and services. 7. Assist them in enjoying their leisure through recreation activities and hobbies. 8. Students are motivates by qualified and experienced staff. 9. All the staff members are always ready at disposal of study. Copyright © Babu Anant Ram Janta College. All rights reserved.